Call upon the Santa Ynez Valley during October and you may spy fantastical fall figures, hither and yon. October is the month to find all sorts of fall-fun figures sprouting up around the Santa Ynez Valley. SOLVANG... and Los Olivos and Los Alamos and Buellton and other towns of the grape-glorious region will be full of the comical, seasonal decorations. 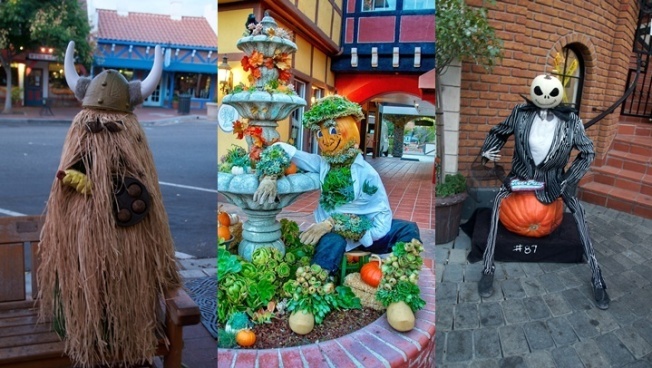 There are scarecrows all over during the annual Solvang Scarecrow Fest, in fact, but they're not just adding to the October atmosphere, though that is a big part of it; there's also a chance to pick your favorite scarecrows in six different categories: Photo Op, Recycled Materials, Business Theme, Most Danish, Spookiest, and Humor. How to lend your scarecrowian expertise to the month-long event, which dots the area, delightfully, for all of October? THERE SHALL BE BALLOT BOXES, so keep an eye out for places to leave your votes. The Harvest Cup will go to "the ultimate winner" later in November, and the winner will be able to display that trophy for the following year. It's in very good spirits, with plenty of local pride woven in, so if you're going to the SYV for a wine-tasting day, or an autumn lunch, be sure to view some or all of the sweet, funky, and maybe slightly scare scarecrows before you go.